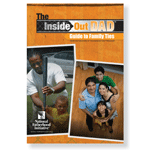 Is the InsideOut Dad® Guide to Family Ties Effective? At NFI, we’re committed to evaluating and improving our resources so organizations will have the highest quality and most effective fatherhood resources in their work with fathers and families. This commitment extends beyond evaluations of our intensive, group-based programs to many of our less, intensive, but no less important, resources. To that end, we partnered with U Count Family Home, a social-service agency in Georgetown, DE that serves incarcerated fathers in several correctional facilities in their part of the state, to evaluate the InsideOut Dad® Guide to Family Ties. 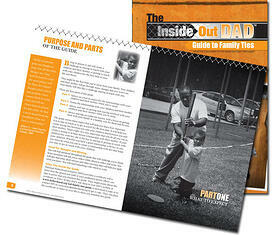 The InsideOut Dad® Guide to Family Ties is a self-paced, interactive resource for incarcerated fathers. Practitioners can use it as a stand-alone resource or as a complement to NFI’s InsideOut Dad® group-based program or any other parenting or rehabilitative program. First, research shows that establishing and maintaining connections to family members is a critical, if not the most critical, factor in reducing the risk that incarcerated individuals will return to prison or jail after their release. Second, not every incarcerated father can participate in NFI’s group-based InsideOut Dad® program. Some corrections systems and facilities that use the program have limited capacity and cannot provide enough groups to meet the demand of fathers who want to participate in it. Other systems and facilities lack the capacity to provide group-based fathering and parenting programs of any kind. And some fathers are reluctant to participate in group-based programs preferring instead to use self-paced resources. U Count Family Home is a new 3/4 recovery house in Georgetown, DE with a special focus on dads in recovery. The typical resident is coming from prison, homelessness or rehab, and working toward reunifying with their children. In the fall and winter of 2012, U Count staff provided the guide to a diverse group of 49 fathers in one of the facilities they serve. U Count staff administered a pre-test before the fathers read the guide and completed its interactive exercises. After they finished the guide, these fathers completed the post-test to measure the impact of the guide on their knowledge about the content in it. Thirty-three (33) of these fathers also completed a survey that measured their satisfaction with the guide. The results of the evaluation illustrate that the guide increased fathers’ knowledge in several areas that are critical to helping fathers, while they are in prison or jail, to create and maintain connections with their children and families. The results also illustrate that the guide accomplishes each of its objectives and that fathers are very satisfied with the guide. So, is the InsideOut Dad® Guide to Family Ties Effective? You bet it is! For more details on the evaluation, download a copy of the evaluation report. And be sure to order your copies of the guide today!